How does your solar system save you money? How can you maximise the savings? How can you calculate a good estimate of your savings? Let’s look at each of these aspects in turn, then get down to the detailed instructions for how to calculate a good estimate of your savings. Your solar panels are capturing solar energy from sunrise to sunset, producing DC electricity and passing it to the inverter. The inverter turns it into AC electricity then passes it to the point of demand at your premises, making it available to your house or business. If there is a demand for electricity, then the solar generated power from the inverter will be used. This is, of course, free power. On the one hand, if the demand exceeds the inverter’s output, the excess demand will be met by power coming in from the grid, so you will be using a combination of free and costly power. On the other hand, if the inverter’s output is more than enough to meet the demand then the unused electricity moves off your premises and goes on to the grid to be used by someone else. In this scenario, as well as the financial benefit of having your own demand met by free power, you can get a small payment of about 6 or 8 cents per kWh for the excess solar power that goes on to the grid. This net amount is metered, in kilowatt-hours (kWh), thus the name Net Metering. In the case of variation within a single day, in general terms, as time progresses from sunrise to the middle of the day, the panels capture an increasing amount of energy, then as the time moves past the middle of the day towards sunset, less energy is captured. This pattern of increase and decrease is affected by the horizontal angle between the panels’ orientation and North (the angle of azimuth – see diagram 1). If your panels face a little east of north, the peak capture time could be late morning. If the panels face west then the peak time could be mid-afternoon. There is also a small effect due to temperature, with the panels producing slightly more when they are cooler than when they are hotter, although this is only a marginal effect. diagram 1: The solar panels are where the Observer is and the Sun is the Star. In the case of variation across the course of a year, the most obvious variable is the length of the day. Depending on your latitude, as the seasons change then the time between sunrise and sunset can vary from less than 10 hours to more than 14 hours. 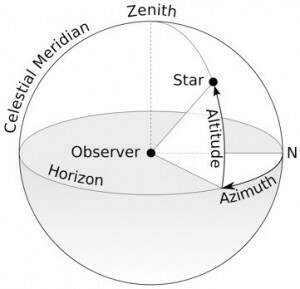 Equally important, and related to the same seasonal changes, is the vertical angle formed between the solar panels and the sun (the angle of altitude – see diagram 1). During Summer when the sun is more overhead and during Winter when the sun stays lower in the northern sky, the best angle between your solar panels and the sun is formed each day for only brief periods or may not be reached at all. During Autumn and Spring, the optimal angle may be formed for substantially longer periods each day. In order to maximise the time during which your panels enjoy this optimal angle of altitude, they are probably tilted by virtue of the slope on your roof or by being mounted on tilt-frames. Generally speaking, the panels capture energy more on sunny days and less on cloudy days, so the weather is a big cause of variation in solar energy production. In any case, the precise amount of captured energy fluctuates from moment to moment, because of changes in cloud cover and other things in the atmosphere such as smoke. Of course, any shading of the panels from nearby trees or adjacent buildings will have a pronounced affect. This is perhaps the most important area to understand because, unlike the effects of the seasons and the weather, this is where you can make a real difference to the amount of savings from your solar system. Importantly, we must accept that some electricity usage cannot be time-shifted. We tend to boil the kettle right when we want a cup of tea, not three hours beforehand!! We tend to turn the lights on when it’s dark. When it’s cold we put the heater on. These are all examples of electricity usage that is not easy to time-shift. Sometimes, fortunately, things line up with each other nicely. For example, during a sunny summer’s day when the solar panels are producing near their peak, me might feel hot and turn on the air-conditioner and thereby use a lot of free power to cool the room. We have seen that the power captured by your solar panels is turned into useful electricity by your inverter (see the above section on Understanding Net Metering). As the inverter puts out this electricity, it counts precisely how much and it keeps a running total in kilowatt-hours (kWh). This figure is known as the eTotal. Your inverter can display the eTotal at any time. Some inverters have a display which constantly shows the eTotal. Some inverters have to have their button pressed a few times to get the eTotal to display. The most accurate way to know how much free power your solar system has produced involves knowing the eTotal on your inverter each time your electricity meter is read by the power company for billing purposes. If you take note of the inverter’s eTotal on the day your electricity bill arrives and then again when the next bill arrives, then it is easy to calculate how many kWh have been produced during that period, which will closely approximate the period on your bill. Now, calculating your savings would be very easy if every kWh in the eTotal was consumed by your household. One would simply multiply the eTotal figure by the cost you would have had to pay if you were buying the power from the grid. For example, if the eTotal said 1,000 kWh and power costs were 35 cents per kWh, then you would have saved 1,000 X 35 cents = $350.00. However, things are rarely this straightforward. Most households won’t use 100% of the power from their inverter. Ideally, most of the free solar power is used by the household leaving only a small remainder to automatically flow out on to the grid, where it becomes the property of the electricity retailer (e.g. Origin Country Energy). For example, some households might use 95% of their solar power with the remaining 5% flowing out to the grid. How can we know just how much of the free power we have used? A simple bit of arithmetic will tell us. This will be a figure in kilowatt-hours (kWh). Secondly, from your electricity bill, take the number of kWh that have been exported to the grid. This is the number of kWh for which you have been paid a small amount, usually 6 or 8 cents per kWh. This will usually be a separate line, itemised within the detail of your bill. In the dollars and cents column, it will be depicted as a credit amount. Let’s call the exported kWh number kWh(Exported). If your bill detail does not have such a line for exported kWh, then congratulations you have used 100% of your free solar power and the value of kWh(Exported) in the next step will be zero. Now, take the eTotal(period) and deduct kWh(Exported). The resulting number of kWh tells you how much of your solar system’s output you have been able to use yourself, from which you can calculate your dollars and cents savings by multiplying it by the cost per kWh, which is usually about 35 cents (including GST). At first, this series of calculations might seem a bit complex and it may take a few goes through it to make sure you have it done correctly. With time, you’ll find your understanding deepening and the amount of savings becoming more clear.